Constitution Day commemorates the anniversary on September 17, 1787 of the conclusion of the Constitutional Convention at Independence Hall in Philadelphia. The Constitution was not ratified without vigorous national debate and the addition of the first ten Amendments, our Bil l of Rights. And, of course, with the addition of seventeen more amendments (including a new one in every decade of the 20th Century, except the 1940s and 1980s), the Constitution continues to be written by every generation of Americans. Here’s a piece that Bob Monks and I have on the American Constitution Society blog, Let’s Take Constitution Day Seriously. We note the contingency of the republican form of government, and the challenge for our generation to “keep it”, as Ben Franklin put it 226 years ago after the Convention. At Free Speech For People on Constitution Day, we rolled out a promising new initiative to overturn Citizens United and to challenge the increasing tendency of activist courts in recent years to fabricate new corporate rights. Check out the Legal Advisory Committee coming together in this work— an impressive group, including a former Chief Justice of the North Carolina Supreme Court and former Justice of the Montana Supreme Court. Free Speech For People, a national non-partisan organization working to overturn Citizens United v. FEC, has launched a new Legal Advocacy Program, backed by an advisory committee of respected law professors, former judges and attorneys from across the country. The initiative seeks to restore Constitutional jurisprudence based on human, rather than corporate rights, and republican citizenship rather than unlimited money in politics. 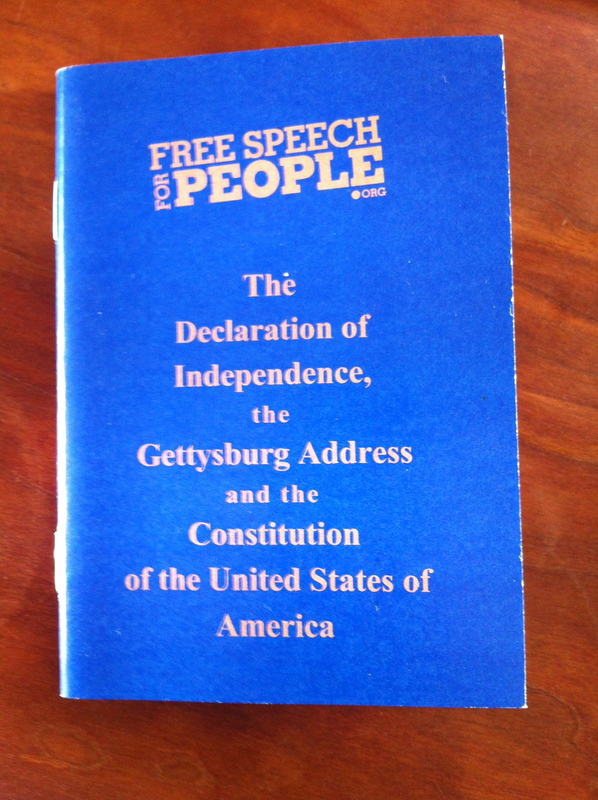 Free Speech For People announced the new program on Constitution Day (September 17th) which commemorates the two hundred and twenty sixth anniversary of the signing of the Constitution at the conclusion of the 1787 Convention in Philadelphia. The Advisory Committee will work with Free Speech For People co-founders John Bonifaz, who serves as Executive Director, and Jeff Clements, who serves as Board Chair and President and is the author of Corporations Are Not People (with a foreword by Bill Moyers) (Berrett-Koehler, 2012). “Americans across the political spectrum know that “corporate rights” and unlimited money in our elections are wrong, and are coming together to ensure that Citizens United will not stand. We are grateful to see so many outstanding legal experts and jurists join in this work to renew our democracy of free and equal citizens,” says Clements. The new initiative will engage in advocacy and public education to push back in the courts against the US Supreme Court’s ruling in Citizens United v. FEC and the fabricated doctrine of corporate constitutional rights and to advance corporate charter reform in the states. The program also will serve as a legal resource for the growing movement for a constitutional amendment to reverse Citizens United. The Free Speech For People Legal Advocacy Program is the latest addition to the expanding challenges to the 2010 Citizens United decision, the 5-4 Supreme Court ruling that struck down longstanding campaign finance laws and opened the door to unlimited spending by corporations, unions, and the super-wealthy. Free Speech For People is a national non-partisan organization, launched on the day of the US Supreme Court’s 2010 ruling in Citizens United, which works to challenge the misuse of corporate power and restore republican democracy to the people. Free Speech For People has served as a catalyzing and leading force in the growing movement across the country for a constitutional amendment to overturn Citizens United and reclaim our democracy. The organization has also played a leadership role in the courts by helping to defend Montana’s century-old law barring corporate money in elections, resulting in a victory before the Montana Supreme Court and the first test case on Citizens United to reach the US Supreme Court. Sixteen states have formally called for a constitutional amendment to overturn Citizens United and to restore democracy to the people. In addition, nearly 500 cities, towns, and counties, including New York, Los Angeles, Chicago, and Philadelphia have called for an amendment, and more than 2,000 elected officials nationwide are on record supporting one. This entry was posted in Action in the States, Constitution, Legal Challenges to Citizens United & Corporate Rights. Bookmark the permalink.